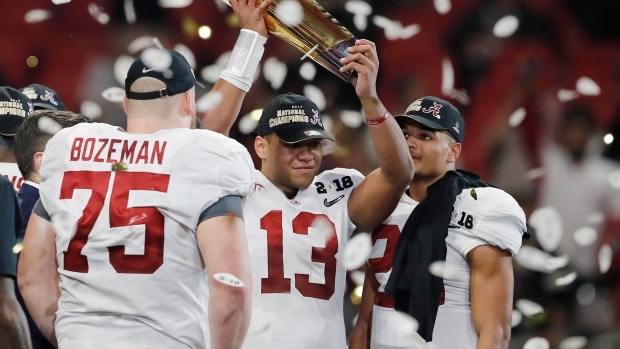 ATLANTA — To add another championship to the greatest dynasty college football has ever seen, Alabama turned to its quarterback of the future, and Tua Tagovailoa proved that his time is now. "He just stepped in and did his thing," Hurts said. "He's built for stuff like this. I'm so happy for him." The Tide might have a quarterback controversy ahead of them, but first Alabama will celebrate another national title. For the third straight season, Alabama played in a classic CFP final. The Tide split two with Clemson, losing last season on touchdown with a second left. What was Saban thinking as the winning pass soared? Smith streaked into the end zone and moments later confetti rained and even Saban seemed almost giddy after watching maybe the most improbably victory of his unmatched career. Tagovailoa took a terrible sack on Alabama's first play of overtime, losing 16 yards. On the next play he found Smith, another freshman, and hit him in stride for the national championship. The all-Southeastern Conference matchup was all Georgia in the first half before Saban pulled Hurts and went with the five-star recruit from Hawaii. The Tide trailed 20-7 in the third quarter after Georgia's freshman quarterback Jake Fromm, hit Mecole Hardman for an 80-yard touchdown pass that had the Georgia fans feeling good about ending a national title drought that dates back to 1980. A little less than a year after the Atlanta Falcons blew a 25-point lead and lost in overtime to the New England Patriots in the Super Bowl, there was more pain for many of the local fans. Two years ago, Georgia brought in Saban's top lieutenant, Kirby Smart, to coach the Bulldogs and bring to his alma mater a dose of Alabama's Process. Smart, who spent 11 seasons with Saban, eight as his defensive co-ordinator, quickly built Alabama East. It was Georgia that won the SEC this season. Alabama had to slip into the playoff without even winning its own division. With the title game being held 70 miles from Georgia's campus in Athens, Dawg fans packed Mercedes-Benz Stadium, but it turned out to be sweet home for Alabama. Alabama drove into the red zone in the final minute and Saban started playing for a field goal that would end the game and win it for the Tide. A nervous quiet gripped the crowd of 77,430 as 'Bama burned the clock. With the ball centred in the middle of the field, Pappanastos lined up for a kick to win the national championship. The snap and hold looked fine, but the kicked missed badly to the left.